49 Walnut Park #4 | Haynes Management, Inc. This space has direct entry and is built out for a medical user with a reception and waiting area, a central work area and lab, two handicap accessible bathrooms, a linen closet, an office and 5 exam/treatment rooms. 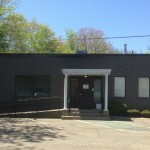 49 Walnut Park, Wellesley Hills is a cluster of four (4) small office buildings which are strategically situated near the junction of Routes 16 and 128. These buildings are ideal for a company that is seeking attractive office/medical space in a prime location at reasonable rents, with a unique identity. The buildings are positioned close to the Charles River and therefor, many of the offices offer river views. In addition, there are many amenities in close proximity to the buildings; such as banks, a post office, many restaurants, a health club, etc.